Pixar animation "Up," which will be released in Korea on July 30, is a box office hit in the United States, racking up US$250 million in the first month after its release. The lighting technical director was a Korean woman, Cho Ye-won. Cho, who joined Pixar in 2004 and was part of the team that produced "Car," "Ratatouille," and "WALL-E," will come to Korea for a preview on Monday next week. "What a lighting technical director does in making an animation is installing lighting equipment on the computer, just like you install them on the set for real movies," she says. From making shadows for 3D animation characters to adjusting colors and light, she does everything with the computer. "You can induce the attention of viewers to where you want in the screen with lighting," she says. 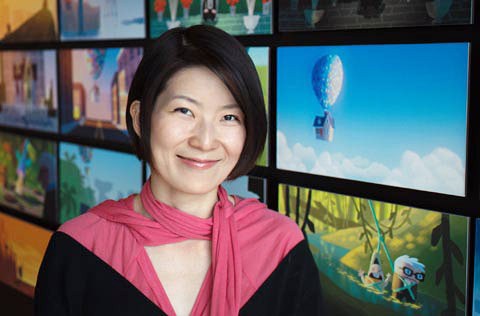 When she first looked at the storyboards of "Up," Cho was "in tears from the fun and the joy it brought." Becoming a lighting technical director of a world class animation studio was, in her own words, "unimaginable." It was when she was studying at the School of Visual Arts in New York after she finished her graduate studies in Korea that she was introduced to the world of animation. "I can say that three-and-a-half years in New York completely changed my life. I was enormously shocked at the style of teaching and the scope of creativity and imagination of the students at SVA, and that made me look at myself critically," she says. After graduating from SVA, Cho took part in making "Shrek II" at DreamWorks, and then got the dream job of all animators worldwide at Pixar. "Both DreamWorks and Pixar are different from other companies in that they think highly of the potential that individuals have, and have complete trust in their employees," she says. Currently working on "Toy Story III," her dream is "to make an animation that can be enjoyed by all people around the world with something that can be discovered only in Korea."